In recent years the importance of sustainable agriculture has risen to become one of the most important issues in agriculture. 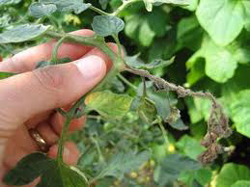 In addition, plant diseases continue to play a major limiting role in agricultural production. The control of plant diseases using classical pesticides raises serious concerns about food safety, environmental quality and pesticide resistance, which have dictated the need for alternative pest management techniques. In particular, nutrients could affect the disease tolerance or resistance of plants to pathogens. Integrative plant nutrition is an essential component in sustainable agriculture, because in most cases it is more cost-effective and also environmentally friendly to control plant disease with the adequate amount of nutrients and with no pesticides. Nutrients can reduce disease to an acceptable level, or at least to a level at which further control by other cultural practices or conventional organic biocides are more successful and less expensive. In an article written by plant pathology scientist and researcher, Christos Dordas, we learn that each nutrient plays a distinct role in promoting disease resistance in plants. Christos' research reveals that Potassium decreases the susceptibility of host plants up to the optimal level for growth and beyond this point there is no further increase in resistance. Among the micro-nutrients, Manganese can control a number of diseases as Mn has an important role in lignin biosynthesis, phenol biosynthesis, photosynthesis and several other functions. Zinc was found to have a number of different effects as in some cases it decreased, in others increased, and in others had no effect on plant susceptibility to disease. Boron was found to reduce the severity of many diseases because of the function that B has on cell wall structure, plant membranes and plant metabolism. Chlorine application can enhance host plants' resistance to disease. Si has been shown to control a number of diseases and it is believed that Si creates a physical barrier which can restrict fungal hyphae penetration, or it may induce accumulation of antifungal compounds. To read the abstract for this review, click here.